Wondering what the future holds for sawmilling in North America? Robotics, real-time saw monitoring and artificial intelligence in kiln controls are all on the agenda for OptiSaw 2019. 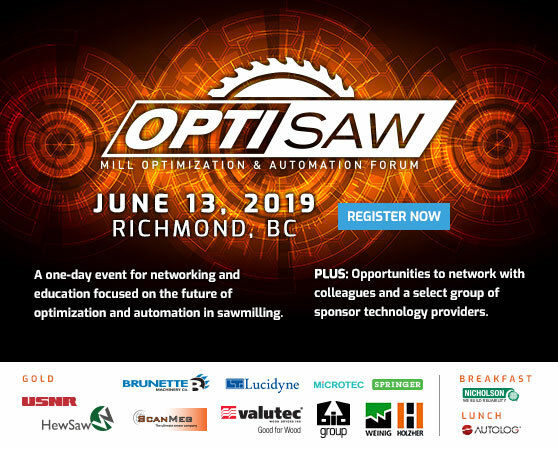 Hosted by CFI magazine, OptiSaw Mill Optimization and Automation Forum is returning to Richmond, B.C., for an information-packed event on June 13. We’ve rounded up speakers from industry-leading manufacturers, lumber producers, and scientists to explain their cutting edge sawmilling technologies and processes, and share valuable insight into the future of sawmilling. Saw science: New research on how sensors can assess the sawing process in terms of surface quality and power consumption. AI in action: A U.S. sawmill case study on the benefits of automated lumber scanning with artificial intelligence. Kiln 4.0: Utilizing intelligent automation and data collection to optimize continuous kiln drying. Don’t wait to sign up. Seats are limited and open only to sawmill management and owners, process engineers, continual improvement managers, optimization staff, researchers and design consultants. Register now for our early-bird rate of $139.